Schaefer: "We definitely will have to consider how to add new capacity worldwide in case this growth rate continues." Daimler's Mercedes-Benz regained global premium-car leadership last year by outselling BMW for the first time since 2005, a feat it wouldn't have achieved without all its factories running at full capacity. 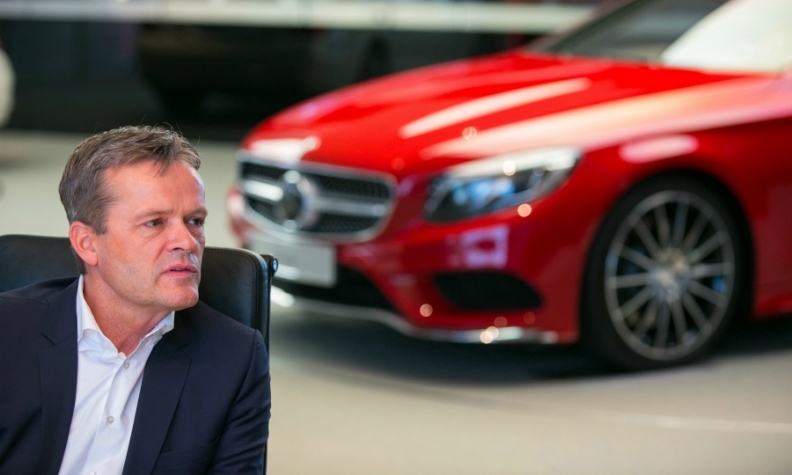 Production chief Markus Schaefer makes sure Mercedes's output keeps pace with record demand. He spoke about the company's production expansion plans with Automotive News Europe Correspondent Christiaan Hetzner and Michael Gerster, a reporter with ANE sister publication Automobilwoche. Daimler's passenger car production has grown at an average annual rate of 9.9 percent over the past five years. Can you maintain this pace? Given we already achieved our 2020 targets last year, we definitely will have to consider how to add new capacity worldwide in case this growth rate continues. We already announced our second plant in Hungary. In several months we will open our production site in Mexico together with Renault-Nissan, but we will also have to further expand our plant in Beijing, for example. How are you preparing your German plants for the production of your EQ electric vehicles? We believe the EQ family will represent 15 to 25 percent of our sales in 2025, but at the end of the day no one can say with certainty how high the share will be. Therefore, we need maximum flexibility, meaning we will integrate the EQ models into the same assembly line as the combustion engine models they will potentially replace. Preparations are on schedule so our plants should be capable of operating at stable output levels whatever the EV take rates may be. But in order to facilitate this greater flexibility, we also had to adapt our relatively high manufacturing depth. I don't want to give a percent figure, but we combed through our production footprint once more, outsourcing areas that had no competitive differentiation. We still utilize the surface area of our factories fully, though, since we expanded into other areas such as lightweight body construction. Due to the complexity of joining steel and aluminum, you need five or six times as much space to achieve the same number of fastening points compared with spot-welding conventional steel. What is your next major challenge? Our system of front-wheel-drive and rear-wheel-drive plants will keep us busy for the next six or seven years, but at some point we want to get away from that and build in any desired mix of FWD and RWD cars together with EVs off the same assembly line in what we call a full-flex plant. Could you build A-class compacts, C-class sedans and an EQ model all on the same factory floor? It could even incorporate SUVs like a GLE. That's the challenge we are setting ourselves for the second plant in Kecskemet, Hungary. We haven't decided which rwd model to add, but we don't have to yet and that's the flexibility we need. It's not our primary goal to build every model line in every factory in the world, but should there be a need for whatever reason, we would be in a position to do so. Keeping our options open as long as possible is crucial in today's market. Main challenge: Create a Mercedes factory footprint flexible enough to shift production at will. You also plan a new factory near Moscow. How can you construct a fully integrated manufacturing plant for just 250 million euros when a paint shop alone can cost that? We've been perfecting a smaller version of the Russian paint shop concept in our Brazilian plant in Iracemapolis for starters. Additionally, we began to add new suppliers, which spurred greater competition among facilities technology providers. Along with last year's push toward standardization in our factories, we are now in the position to erect medium-volume production plants for costs far below those of past years. The rising tide of protectionism has the industry spooked. How quickly could you react if a trade dispute made it necessary to shift volumes from the U.S. to Europe or vice-versa? Should the need arise, we can react quickly. For example, it's possible to integrate contract manufacturers such as Valmet Automotive into our network in a short amount of time. But this is not an option we are thinking about now.